Productivity has become synonymous with revenue for many organizations. The theory is simple: The more your employees can get done, the more income they can generate. And yet data from the Bureau of Labor Statistics shows that the productivity level in the United States is actually fairly low, topping out at 3.1% in one quarter and going into negative digits in others over the past few years.1 This means labor productivity, measured in output per hour of labor, is low or—in many quarters—shrinking. 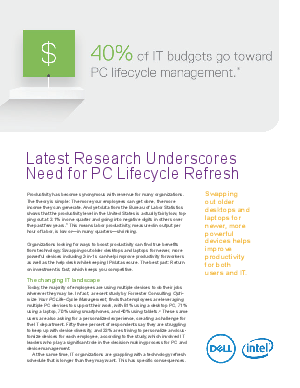 Download this white paper from Dell and Intel® to learn more.